The electric refrigerator has to have been one of the most important improvements in culinary history. Replacing one's old icebox with a new refrigerator was the ultimate in convenience and a huge step forward for health and sanitation. Not only could perishable items and leftover foods be kept chilled at a safe temperature, but it was possible to shop for enough food for several days at a time. The refrigerator eliminated the need to leave an ice card out for the ice man, meant an end to carrying off melted water from the old icebox, and gave homemakers the benefit of year-round refrigeration. The refrigerator could also be placed in the kitchen or pantry, rather than near a door or on the porch where the ice man could have easy access. Naturally, the refrigerator manufacturers wanted every home to have a new fridge, so along with the refrigerators came new recipes that required refrigeration before the dish could be served. Jellied salads, cold soups, frozen desserts and aspic-covered concoctions became part of home menus. Other recipes were updated, among them icebox rolls and icebox cookies. Icebox cookies were renamed refrigerator cookies, although of course the basic recipe remained the same. The cookie dough was mixed, and then the directions advised you to place the dough in the 'refrigerator' until thoroughly chilled. Fortunately, for those of us who love homemade treats, these recipes have survived. Whether you call them icebox or refrigerator cookies, they are still convenient and they taste mighty good. No cooking experience is really necessary to prepare refrigerator cookies from scratch. What could be easier or tastier? The cookie dough is very simple to make and once chilled, the cookies may be baked a few at a time as needed. Almost any dough can be frozen and will keep a couple of months if carefully wrapped. The baked cookies also freeze well, and sometimes it's better to bake all the cookies at once and then freeze some to serve later. This method messes up the kitchen and the cookie sheets only once. Not long ago I was in a demo kitchen in a store on a busy Saturday at the mall. I was slicing refrigerator cookies and baking them in the store. The cookie smell wafted out into the mall and attracted a crowd. As I visited with people, I was stunned to discover that they thought the dough was from the grocery. Not just folks under 30, but people who were old enough to know better. The majority of the people eating cookies, and they managed to eat 21 dozen, had never seen or heard of homemade refrigerator or icebox cookies. Although many of us have limited time for baking, perhaps the refrigerator method will inspire some of you. If you can spare a few minutes to mix the dough, you can find time later to finish the cookies. And even better, maybe a husband or a teenager would be willing to slice and bake. No matter who ends up doing the baking, everyone will benefit. The cookie recipes that follow have been in my collection for many years. The first recipe was passed along by my mother and is the one I used for the demo and cookbook signing mentioned above. This recipe is from the 1940's and is one of the best icebox cookie recipes around. Use an electric mixer to cream the shortening and sugar until fluffy. Add eggs one at a time and beat well after each. Add the vanilla. Combine the flour, baking soda and salt in a separate bowl. Use a spoon to stir the flour mixture into the sugar mixture. Add the pecans, mixing well. Shape into three rolls about 2 inches in diameter and wrap in wax paper. Refrigerate at least two hours or up to three days. When you're ready to bake, preheat the oven to 375°F. Cut the dough into 1/4-inch slices and arrange 2 inches apart on greased cookie sheets. Bake about 10 minutes until lightly browned. Remove from the pan and cool on a wire rack. Store in an airtight container. Yields about 6 dozen cookies. There aren't many recipes for oatmeal refrigerator cookies. This is a great cookie for oatmeal cookie fans. Use an electric mixer to cream the shortening, sugar and brown sugar until fluffy. Add the eggs and vanilla, beating well. Combine the flour, baking soda, salt and cinnamon in a separate bowl. Use a spoon to stir the flour mixture into the sugar mixture, blending well. Stir in the oatmeal and pecans. 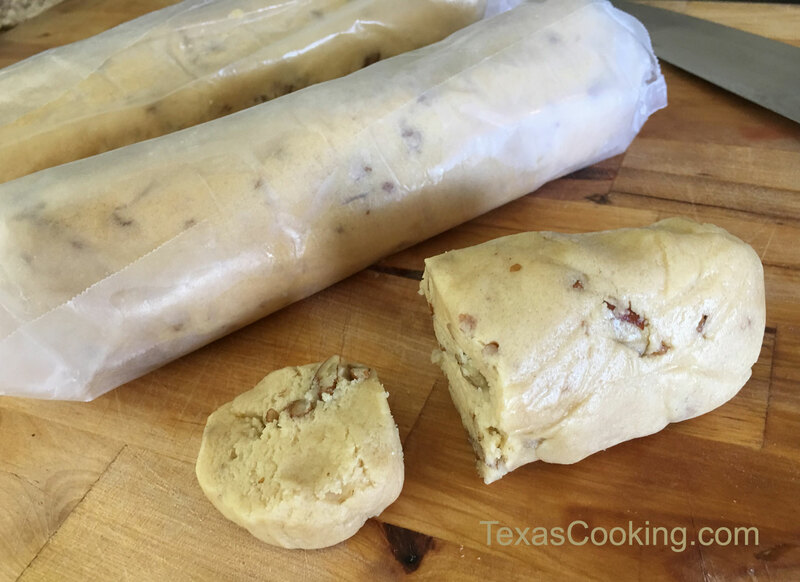 Shape the dough into three rolls about 2 inches in diameter and wrap in wax paper. Refrigerate at least 2 hours or up to three days. Preheat the oven to 350°F. Cut the dough into 1/4-slices and arrange 2 inches apart on ungreased cookie sheets. Bake 9 to 10 minutes until lightly browned. Remove from the pan and cool on wire racks. Store in an airtight container. A great cookie for folks who like dates. Please don't omit the dates or substitute raisins. These cookies contain more cinnamon than other recipes, but the cinnamon complements the date-pecan-brown sugar combination perfectly. Use an electric mixer to cream the shortening, sugar and brown sugar until fluffy. Add the eggs one at a time, mixing well after each. Combine the flour, soda, salt, baking powder and cinnamon in a separate bowl. Use a spoon to stir the flour mixture into the sugar mixture. Stir in the pecans and dates. Shape the dough into four rolls about 2 inches in diameter and wrap in wax paper. Refrigerate at least 2 hours or up to three days. Preheat the oven to 350°F. Cut the dough into ¼-inch slices and arrange 2 inches apart on lightly greased cookie sheets. Bake 8 to 10 minutes until lightly browned. Remove from the oven and cool on wire racks. Yields about 7 dozen cookies.